Oxen Hill Farm is located in Suffield, CT.
Oxen Hill Farm is a small family farm with fields in both Suffield and East Granby, Connecticut. Most of Oxen Hill’s organic produce is grown on the Suffield farm, which has been in the family since the 1800s. Generation after generation has cared for the land and grown beautiful produce and flowers while maintaining the integrity of the soil. 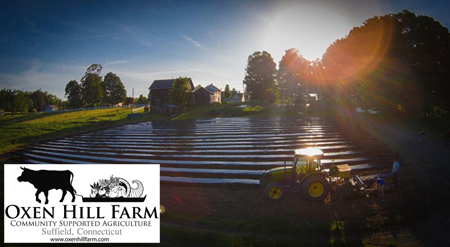 In 2009, Oxen Hill Farm started a new CSA program for local Connecticut residents, and the Griffin family began the rigorous three-year process required to receive organic certification. Oxen Hill Farm now grows over 200 varities of certified organic fruits and vegetables. Boston Organics began working with Oxen Hill Farm in 2014, and their plump field tomatoes are one of our favorite summer treats! Photo credit: Christian Robison. Father and son planting potatoes at dusk in East Granby fields.